Bernie Parent is a retired Canadian professional ice hockey goaltender who played 13 National Hockey League (NHL) seasons with the Philadelphia Flyers, Boston Bruins, and Toronto Maple Leafs. 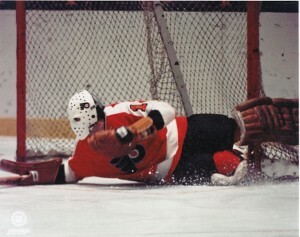 During the 1973–74 and 1974–75 seasons, in what many consider the finest consecutive seasons ever by a goaltender, the Flyers won two Stanley Cups and Parent won the Vezina Trophy and Conn Smythe Trophy both seasons. A 1984 inductee into the Hockey Hall of Fame, Parent was rated number 63 on The Hockey News' list of The Top 100 NHL Players of All-Time in 1998. This is a Color unsigned 8x10 Photo of Philadelphia Flyers Player Bernie Parent.